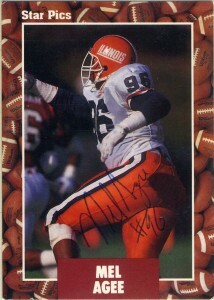 Widely regarded as one of the best defensive lineman to come through the University of Illinois at 6’5″, 300, Mel Agee was a stand out player while playing for the Fightin’ Illini notching 15 sacks. With a nice burst and a good first move off the line, the Colts made the “Big Bopper” their 6th round draft choice in 1990, and he’d make the roster of the team making 29 tackles and a forced fumble mainly on mop up duty and starting in just one game his rookie season. His 1992 season was pretty much lost in the lineup or injured as Mel suited up for one game but did not make a tackle. 1993 saw a shift of addresses to Atlanta for the Bopper. He’d have his best season playing in Atlanta’s 3-4 set up, making career highs with 43 tackles, 2.5 sacks and 7 starts. 1994 and 1995 would see Agee slide into the background again, and by the end of that season he’d retire. In 1998 his number was dialed up by the Frankfurt Galaxy of the NFLE and Agee made 2 sacks before returning stateside to play for the Arena Football League. Over a 5 year career with the Tampa Bay Storm Mel made 8 receptions for 51 yards and 5 TDs. He’d also make 25 tackles, 9 pass blocks and 3 fumble recoveries before finally retiring in 2002. Tragically, in 2008, Mel passed away of a sudden heart attack.